Those of you who routinely follow my blog know that I typically write about business topics: leadership communication, executive presence, sales presentations, business writing, and book writing and publishing. But since we’re celebrating love this week with Valentine’s Day, I’m turning to personal relationships at home. Maintaining rewarding love relationships is both difficult and important. I’d argue that it’s the secret to deep satisfaction. After all, what good is being at the top of your game in business and having all the money in the world if you have no one to enjoy it with? You don’t develop courage by being happy in your relationships every day. You develop it by surviving difficult times and challenging adversity, according to Epicurus. My experience confirms the truth of his observation. Pat yourself on the back if you, too, are building courage by strengthening your personal relationships every year. Sometimes, crisis by crisis. 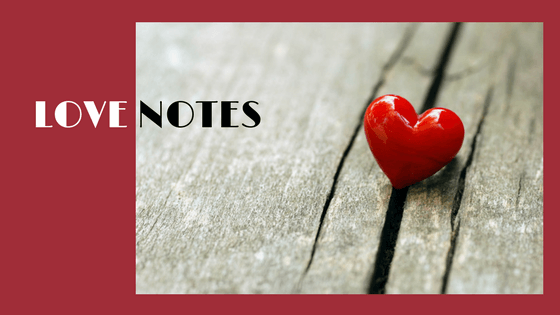 So this week, I’ve decided to share some excerpts from my book, Love Notes: From My Heart to Yours (Thomas Nelson/JCountryman) in the hopes that these thoughts might inspire you to write your own note to that special someone in your life. Some silly, some sincere—but all meant to make someone’s day (or their year) brighter! Go ahead; write that note to your special love! stop worrying. Why should I worry? “You sometimes let me have the last word—even when it’s wrong. one that could cut me to the quick. and crème bruleé for dessert. “Talk takes time but opens my heart to your love. and attitudes that are worth keeping—and discarded those that are tattered and torn.